White Bird has brought the Paul Taylor Dance Company back to Portland for the sixth time this weekend, a remarkable dedication to the twisty elegance, dark undercurrents and sheer fun of Taylor’s work and the talent of his dancers. This particular visit touches all those bases with a program that spans a period in Taylor’s choreography after he’d moved past youthful exuberance toward a more layered, focused art. Arden Court (1981), Syzygy (1987) and Piazzolla Caldera (1997) are all well-made dances that retain Taylor’s playfulness and his darker side, on one hand, and integrate them into formal movement invention of the first order. I’m going to talk a little about each of those pieces, but in the analytical process, I hope neither the delight of the visual spectacle nor the bone-deep communication of the dances gets forgotten. That experience is the most important aspect of a Taylor concert, after all, and the reason that the company’s many visits to Portland make sense. Paul King and Walter Jaffe started White Bird 20 years ago, and the first company they brought to town was Taylor’s. I think of this decision as a sort of marker, a statement about how King and Jaffe thought then (and perhaps continue to think) about quality, creativity, importance. And it has served them—and their audience—well through those two decades. The three dances on the program have some things in common. In all of them, dancers seat themselves on the floor and watch comrades perform a solo: They assume the seated position in interesting ways and then watch intently. Depending on the context, maybe they are judging the soloist, maybe admiring her or him, maybe even leering a little. In all three, one dancer performs a movement phrase, while another orbits, and yes, depending on the context, the orbiting dancer can seem locked out of the attention of the central dancer. Keeping that in mind (and understanding that Taylor DOES make real, full-fledged duets), his choreography has a way of keeping potential duets from happening—which builds tension and observes that, in the world, we can be more alone than happily coupled. Me: I liked what you said about Debussy, about how there’s always something unsettling under the surface of so much of his work. And I guess I think of your work in a similar way. Taylor: Well, I’m a realist. I report. The world is not all glossy. Taylor: And I’m not either. This is one of the ways Taylor builds tension in his dances, these sudden jolts of “reality,” or what critic Marcia B. Siegel calls “dingy corners” of otherwise “heavenly” dancing. Taylor typically builds a movement structure, often around a great piece of music (he’s partial to Bach), and then subverts that abstract design, both music and movement, in various ways—with a puckish whimsy sometimes, other times with something that reminds us of our violence, our desire, our loneliness. But then the delightful pattern resumes and you’re left wondering if you just imagined those disruptions. In Arden Court, Taylor fashions a stately drawing room dance around excerpts from the symphonies of Baroque-era composer William Boyce. 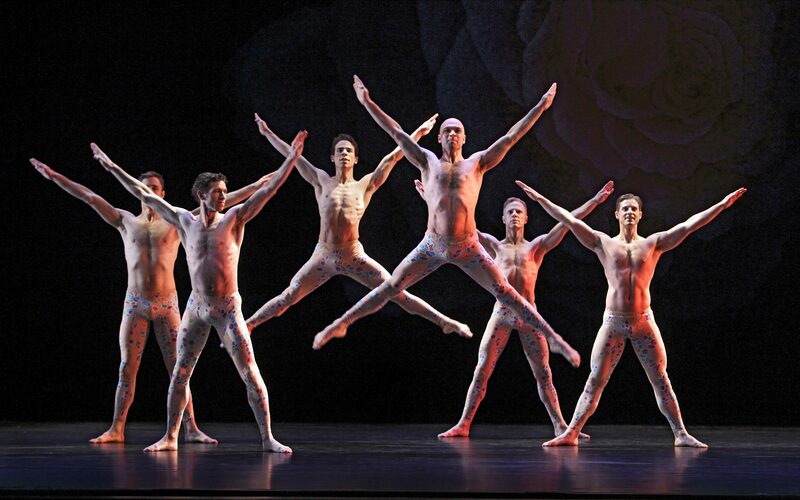 The movement alternates between elegant and funny (in a repeated idea, the dancers take big straight-legged strides while swinging straight arms in robotic arcs, for example), but the orbiting of the women dancers around the preening men, who are shirtless and engaged in their manly phrases, is especially effective here. In one section, the music speeds up to what seems double the tempo, and suddenly those elegant leaps and pattern-making take a turn toward the impossible—and the exhausting. I had seen Syzygy before, in 1999, and talked to Taylor about it then. He called it a “mess,” but that was just a bit of winning self-deprecation, I think! The place to see the birth of the last dance on the program, Piazzolla Caldera, is in the Matthew Diamond documentary, “Dancemaker,” which tracked ten months in the life of Taylor and his company. Although it employs the great music of Astor Piazzolla, who turned tango into an art music, the dance isn’t actually tango. There are a few flamenco stylings, yes, and lots of the tension inherent in tango, the sexuality and the stylized aggression, but the steps are Taylor’s and they are wonderful—fiery and funny and oozing, alternately. They also tell a sort of a story, how a young woman, danced by Parisa Khobdeh, is ostracized from the group and attempts to find her way. I’ve made a few general comments about how well the dancers move—they inhabit their phrases, attend to the music and more importantly, attend to each other. Everything is razor sharp and they attain speeds that you should not try at home, unless you have expert supervision. Among a great corps, Khobdeh, Ho and Michael Trusnovec received the majority of the more extended moments, but whenever my eye settled on another dancer, Heather McGinley in Syzygy, for example, or Eran Bugge in Piazzolla Caldera, I was rewarded. I think you will be, too. If you’ve seen all the other Taylor visits to Portland, you’ll see something new, I’m almost sure, and be comforted that in this crazy world of ours, some excellence continues. And if you’ve never seen Taylor before? Well, take your chance while you can. The Paul Taylor Dance Company performs at the Newmark Theatre, 1111 SW Broadway, at 7:30 pm Friday and Saturday, October 13-14.